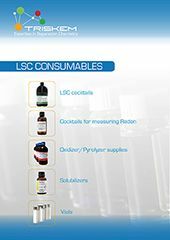 TrisKem International is distributing Meridian Biotechnologies range of Liquid Scintillation Cocktails including the Gold Star line of classical Safer Cocktails, the environmentally friendly ProSafe range and non-water-miscible cocktails for Radon counting, glass and PE vials of various sizes and Pyrolyser/Oxidiser consumables. Further information on the respective products may be found in the technical documentation and the product sheets in the table below. James Thomson (Meridian Technologies) was also so kind as to provide us with a presentation on the preparation and use of quench curves and the Do's and Don'ts of LSC. Glass and plastic vials for liquid scintillation counting.